RISING COLLEGE TUITION fees in England, Wales and Northern Ireland have led to a significant increase in the number of UK students applying to attend colleges in the Republic of Ireland. College Admissions Office data released this morning shows that nearly 2,500 people with addresses in the United Kingdom have made applications to Irish colleges this year, up from under 2,000 last year. The rise can be attributed to increasing tuition fees in Britain – although tuition is free in Scotland, new rules regimes mean that colleges elsewhere can raise their fees from £3,375 (€4,000) to £9,000 (€10,700) per year. This compares to the Irish system, where although students will have to pay a ‘contribution’ of €2,250 to the cost of their tuition, students do not have to pay full tuition fees as long as they are an EU citizen or have spent three of the last five years living within the EU. The CAO figures also show that demand for science and computing courses has shot up, with the number of students putting science courses as their first preference up by 18.5 per cent on last year – and up by 63.5 per cent on four years ago. Computer science courses have also seen demand surge – with NUI Maynooth seeing a 60 per cent increase in applicants. Other courses with a traditionally high interest rate have fallen somewhat, however: the country’s most popular course, Arts in UCD, has seen applications fall by over a quarter, while demand for business courses has also fallen. 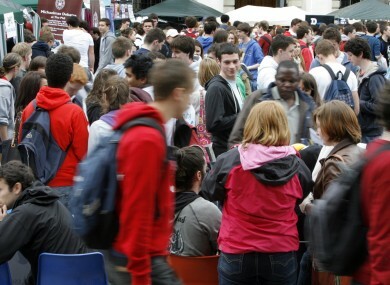 When the bump in UK applicants is removed, the overall number of applications this year is almost equal to last year’s number, meaning there will be no overall extra demand for courses – though the increased demand for courses in some disciplines will likely mean a higher CAO points threshold will be required for entry. Email “Surge in tuition fees sees major spike in UK CAO applicants”. Feedback on “Surge in tuition fees sees major spike in UK CAO applicants”.